FOR different species to survive it is necessary that they breed in enough numbers so that the offspring grow up to take place of adult members when they become aged and ultimately die. Broadly speaking, in the struggle to reproduce, animals can either breed in large numbers in the hope that some of them will survive; or they can guarantee that most of their progeny survive by protecting and nurturing a small number of young. These two types of sexual reproduction, which can be termed as profligate and highly economic can take place only if both the sexes cooperate with each other. This cooperation is seen in amphibians and fish. In the breeding season, males and females come closer to each other, and even without physical contact a male fertilises the eggs by sprinkling sperms on them as the female unloads her swollen belly. The above is profligate type of reproduction, but in the economic type, where care for the young is included, there are some extremely complicated behavioral interactions between species members. Some species become territorial during the breeding season, with the result that all sorts of new patterns of behaviour appear. For instance, on the one hand animals become highly aggressive against intruders, whereas in the case of their own offspring they not only feed them but also protect them against all sorts of dangers. In many animals, both parents cooperate closely in defending their territory and the young. This wasp is an ungrateful guest, indeed! It has been observed that the herring gulls behave differently in different seasons of the year. For instance, in autumn and winter they live together in flocks and act as a homogenous mass of birds that feeds, sleeps and flies together. During this period they do not recognise any individual in the flock and respond to group behaviour. If one bird is disturbed and starts uttering the alarm call, the others immediately get alerted. Should the alarmed bird flee, the rest, even without being aware of the cause of danger, will at once follow it. In spring, their behaviour becomes different, all members of the flock make for the sand dunes – their breeding grounds. There many of them settle on the ground in pairs of opposite sexes and take possession of patches of ground that they will defend as their territories. An unmated female has to entice a male, which she does by approaching a lone male in a very special ‘appeasing attitude’; for he at this time, in anticipation of having a territory of his own, is becoming quite aggressive. If he accepts the female’s submissive approach, he may either strut around and threaten any males in the vicinity, or he may utter a long-drawn cry and make off with the female. Very often the female confirms her willingness by ‘begging’ for food with a curious tossing of her head, to which the male responds by regurgitating a morsel of something. Experts believe that this courtship serves to acquaint the two birds with each other and strengthens the bond between them. This is how pairing in herring gulls takes place and once it is done both the birds select a territory for themselves somewhere in the colony. This is the period when paired birds become highly intolerant and aggressive towards intruders. Actual attacks on intruders are rare as threatening gestures are generally sufficient to drive them away. Sometimes both males and females join each other in driving the stranger away. After the eggs are laid both the birds begin their long vigil of incubating the eggs and once the eggs have hatched they protect and feed the chicks. The transformation in a bird’s behaviour from being a homogenous part of the flock to becoming territorial, having a mate and then caring for the young, depends entirely on new patterns of nervous activity being unleashed in the brain. According to experts, it is the sense of the season of the year that plays a major role in changing the behaviour of birds. The message of change in season is carried from sense organs to other parts of the brain through special hormones. It has been proved that in birds and mammals, prolactin, a hormone, secreted in the pituitary gland, plays a major role in bringing out the parents’ instinctive reactions to build nests and then care for offspring. Often there is some form of conflict involved. For example, a bird guarding its territory during the breeding season will be aggressive towards intruders and yet be protective and caring towards its young. The young must, therefore, not arouse any aggressive instincts in its parents, and for this reason the young very often remain non-descript and unaggressive. Furthermore, when the adult birds see the open beaks of the young clamouring for food, they respond by regurgitating a morsel and passing it on to the young. In their turn, the young only expose themselves when the parents are present. 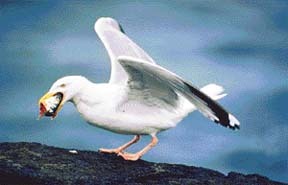 The herring gull has a red patch on the end of its bill, and only when the young see this do they become active and beg for food. This behavioural response serves to protect the young from exposing themselves at the wrong time, when a predator is lurking in the vicinity. There are innumerable examples of parent-young response in birds, and they all indicate how complicated social life is even at the level of the care of the young. As an animal becomes more concerned with other individuals of its species, more aggression comes into play. At one level, in, say, the flock behaviour of birds like the house sparrow, the wagtail or the jackdaw, we can see a sudden communal attack on a predator such as a sparrow hawk, an owl or a prowling cat. Such an attack usually means the entire flock ‘dive-bombing’ the unsuspecting ‘foreigner’ so that it is forced to flee or take cover. When animals exhibit any form of territorial behaviour in combination with social behaviour, aggression becomes more and more prominent.